Few minutes from Grenoble is La Corne D'Or a restaurant located in Corenc with stunning views of the city and its surrounding mountains. 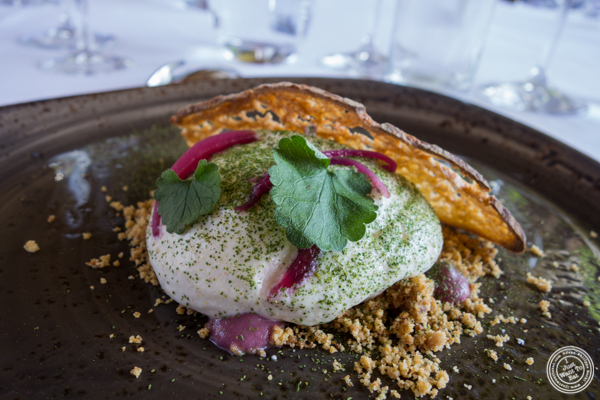 There, the Borrel family created a relaxed atmosphere in a wonderful setting, where Chef Alexandre Bonnel feeds hungry patrons not only stunned by the views, but also by the creativity of his food. This is not a Michelin starred restaurant, but it surely deserves to be recognized. Aperitif: a tradition in France to have a cocktail before meal. Me: the house made cocktail made with champagne and elderberry (sureau in French). Jodi: an orange lemonade that is 100% organic, made in a city close by with water from the Vercors. Beet tart with elderberry (after our experience at Noma few years ago, we are getting used to eating flowers...). Fennel purée with artichoke and sesame. Second amuse bouche: it was maquereau a l'escabeche (mackerel with escabeche sauce), zucchini velouté, peas and fermented celery. Jodi got the same dish but without the fish. Appetizer: cauliflower cooked in different ways. It was like a mousse of cauliflower sitting on a crumble, pickled red onions, soubise sauce (sauce made with onions and butter) and haddock (Jodi did have the same dish but without the fish). 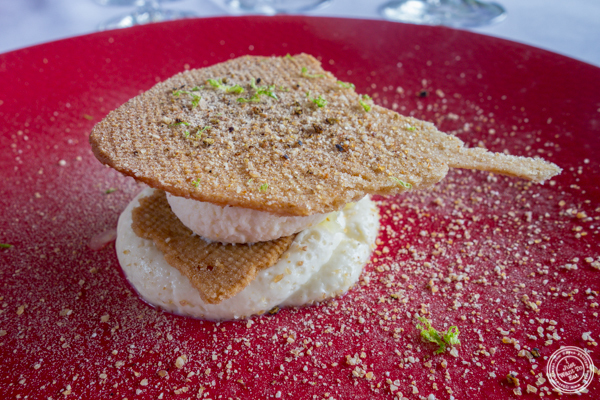 Entremet (an entremet is a small dish served between courses): cumbawa (Sort of lemon used in Thai cuisine) sorbet, ginger, lemon and lime, sesame crumble with an espelette pepper tuile. Me - Fish course - organic trout from the Vercors (it was poached), trout eggs, carrot purée, carrots and peanuts tuile. 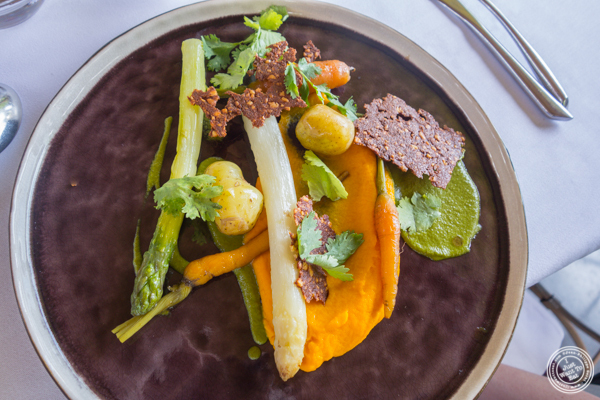 Jodi - vegetable plate composed of carrots, carrot purée, asparagus. potato and peanut tuile. Then, a pre-dessert (interesting concept but let's be honest, it means we had two desserts...Yum!). It was a juniper mousse with lemon confit, lime zest and a buckwheat tuile. 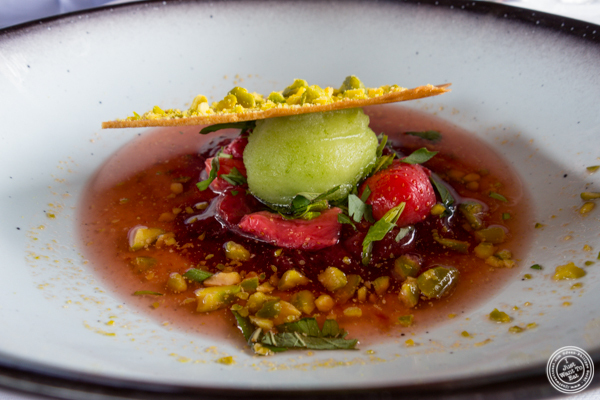 And for dessert, a strawberry theme with strawberry compote, strawberry soup, sorbet made with mint, tarragon and coriander, and a pistachio tuile as well as crushed pistachios. The dessert wine is called Pet'Nat' that is Pétillant-naturel (natural sparkling), an ancient winemaking style from France. It was a sweet sparkling rosé, perfect with that dessert. Overall the meal was fantastic: creative, each plate looked beautiful and tasting very good, including the desserts that were a good way to end such a nice experience. Don't you hate when you have a great meal but the dessert is not good at all? Or worse: when there is no dessert? I surely don't. So, if you are near Corenc, LA Corne D'Or is a good address for a Michelin Star like meal.